After her first career Top 10 win over Petra Kvitova in Stuttgart, American Madison Brengle sat down and talked about flying under the radar, setting herself new goals on clay and the emotional turmoil her favorite TV show put her through this time last week. Last year, Madison Brengle came into Stuttgart ranked No. 153 and lost to World No. 288 Katerina Vankova in the first round of qualifying. This year, the American made the main draw directly — albeit at the last minute, when Eugenie Bouchard pulled out of the indoor clay tournament. Well prepared for the indoor conditions from the last few days, Brengle defeated Italian lucky loser Alberta Brianti in her first round and, earlier today, took on World No. 4 Petra Kvitova. Brengle had a strong start to the season, reaching the Hobart final and the fourth round of the Australian Open before losing to her countrywoman — and fellow Madison — Keys. Due to her success Down Under, the American climbed into the Top 50 and provided steady, but not spectacular, results as the clay court season began. After losing an ITF final in Osprey to her good friend Alexa Glatch, the 25-year-old reached the third round in Charleston, falling to defending champion, Andrea Petkovic. 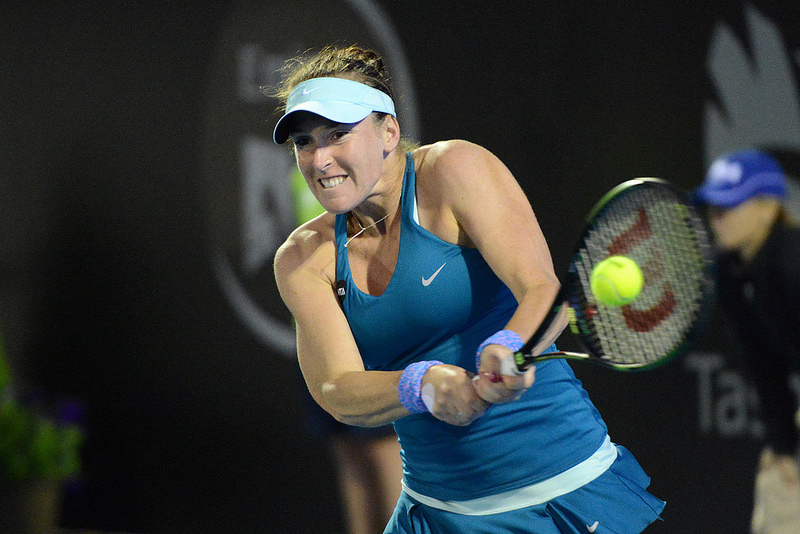 “After Australia, people, like, asked me, ‘What do you want to work on; what are your goals?’ A big one for me was having better results on clay,” Brengle admitted. “I played some good matches here and there, but it wasn’t as solid all the way through as I would have liked. There have been several young Americans making waves over the past few years, but Brengle’s rise came a little left of center. An Australian Open and Wimbledon girls’ singles runner-up in 2007, the American struggled to transition onto the WTA Tour, but even her recent rise up the rankings has still still allowed her to keep a low profile — a position she quite enjoys. Just like another unexpected clay-court success story from 2014 — Jana Cepelova’s run to the final at the Family Circle Cup — Brengle is in Stuttgart without a coach. The question is — how does a player prepare for a match without a coach or without anyone by her side? The American has her own way of going about it. A very happy and chatty Madison Brengle with the press. At the Australian Open, Brengle said that she was a huge fan of the television show Scandal and enjoys the occasional Olivia Pope-esque glass of red wine. At the end on Thursday’s press conference, conversation turned to the latest episode — which ended on a massive cliffhanger — and an emotional Brengle had a lot of thoughts. Tomorrow, Brengle will play Caroline Garcia in the quarterfinals. By virtue of defeating Kvitova today, she has already guaranteed that she’ll break the Top 40 for the first time in her career. What do you make of Brengle’s rise and chances in Stuttgart? Sound off in the comments! I am so proud and happy for Madison ! She does not get enough respect from tv people and press. Madison should have played in the Fed Cup over Davis that is obvious . She shows that fighting hard can overcome and that hard work pays off. I think she can get into the 20’s by year end.